Frisco Black Exercise Pen with Step-Through Door provides a safe and secure play area for your pet, whether indoors or outside. Constructed using sturdy metal wire coated in durable black e-coating, it’s made to last. The easy-access doorway securely latches closed with double locks and an additional safety clip. Metal anchors are included to keep the pen in place when used outdoors. The eight hinged panels can be configured into square, rectangle and octagon shapes, with plastic corner stabilizers included for the octagon configuration. And it conveniently folds flat for easy transport and storage. 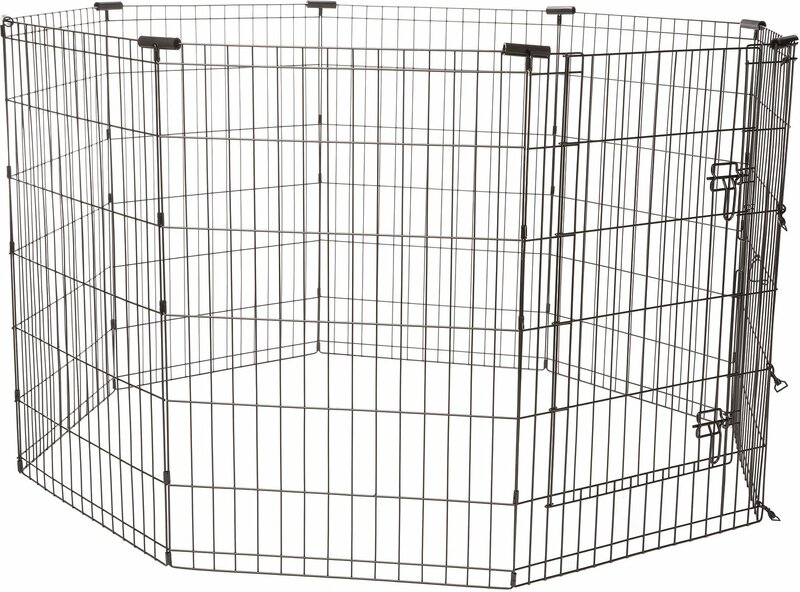 A great playpen for puppies and adult dogs alike. Easy-access doorway securely latches closed with double locks and an additional safety clip. Easy-to-fold construction is great for travel and storage. Metal anchors are included to keep the pen in place when used outdoors. 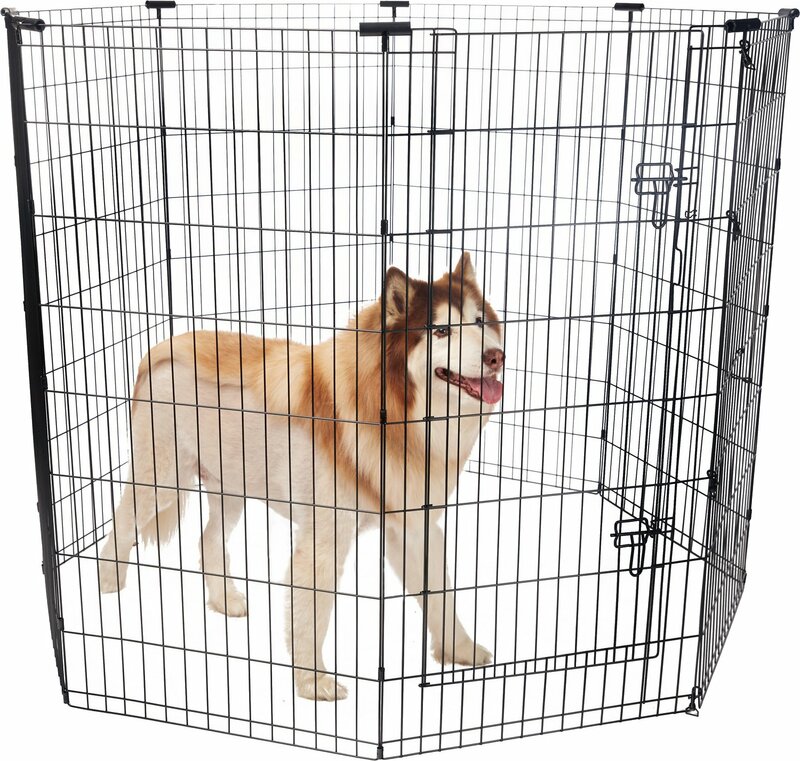 Constructed using sturdy metal wire coated with black electro-coat finish so it's made to last. For dogs that need a larger play area, or for multiple pets, you can connect two Frisco exercise pens together using the included snap hooks. To provide your pet with the most comfortable pen possible, clean the exercise pen routinely with a mild, non-toxic cleaner and water. Whether you're a new puppy owner or your dog tends to get into everything, the Frisco Dog Exercise Pen gives him a safe place to play and rest. It can be used indoors to separate your pup from guests or keep him out of rooms that are off-limits for curious canines. And it's perfect for outdoor play, especially in yards without fences. Keeping your pet safe is the most important consideration. Two slide-bolt latches and an additional safety clip secure the door to prevent a daring escape. When you're outdoors, use the included anchors to keep the pen rooted in place. The sturdy wire panels have rounded corners and are covered in a durable, black e-coating. Practical design features make the Frisco Pen adaptable, reliable and easy to use. It comes with eight connected panels that can be arranged in several different configurations. You can even form two smaller pens with separate entryways. When it's in an octagon shape, the corner stabilizers can be used for extra support. 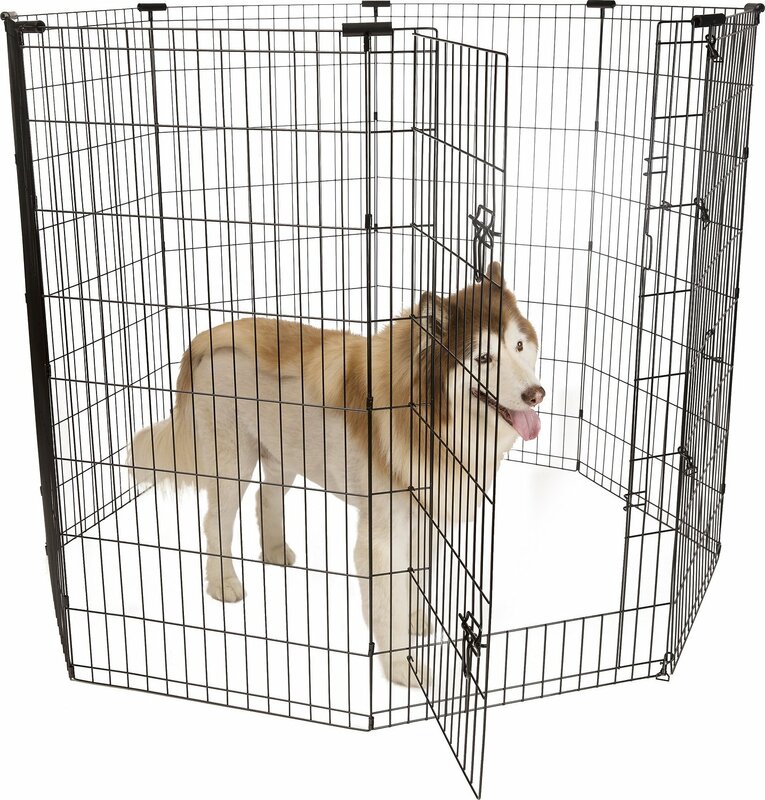 The Frisco Dog Exercise Pen is made to fold flat for compact storage and portability. That makes it easy to take to the park or camping, and when you're done, you can pack it up into a space-saving, rectangular shape for storage in the car or at home. Decent value, a little lightweight and wobbly but it works. GREAT Pen, Works like it should. I bought 2 of these to place around my Common Milkweed Patch to keep Rabbits from eating them. The pens are sturdy, hold up well in the elements (4 years now) and the door fastens securely and holds tight. Position them so they are octagonal shape and they stand even in the strongest of wind. I am back here today to buy another one to add on as the milkweeds are spreading out and is a larger area now. I am super happy with these pens! Love this Ex Pen for several reasons. . . It has a door! Instead of trying to climb over the top of the pen, why not use a door? It is perfect. I don't know why all Ex pens don't have a door. It seems to be more rare than common. Next, this ex pen configures to any shape. The little black corner pieces do the job and hold the configuration in place. In fact, I attached my pen to a wire crate, and it works perfectly with the pen and crate combined. I love the play pen! I bought this since we have a small puppy for now that's growing into his size. However, placing this fence outside (at first we didnt put the bottom stabilizers in the ground as we was just seeing how it looked) and it tipped over very easily. Then we pegged it to the ground, and my 3 year old was in it with the puppy and barely leaned his back on the side; and it collapsed on him. Which he's a tough kid, neither of them was hurt. If it just had a little bit more stable to it; it would be much better. Still would recommend tho. Set up went well for my son-in-law. looks great in my kitchen area, however when I left the kitchen, my new 12 month old cairn terrier somehow climbed out of her "play pen". She did it a few more times, so now it is no longer being used, At least she is housebroken and stays in whatever room I am in and goes in her kennel when I leave. If a person doesn't have a "climbing/jumping dog" it is fine. I ordered 2 sets of the fence and was surprised how heavy they were, which I'm glad so my dog doesn't push it over. Although one of the boxes was missing parts I used zip ties to enclose the fence and works just fine. Still would have liked to have the hook enclosures so I don't have to cut the zip ties everytime I need to put it away. Never the less it does a great job for what I need it to do. I love the play pen. my apartment is pretty small (554 sqft) so I took two of the gates off to make a hexagon and it is plenty of room for my little frenchie. It was very easy to put together. The only thing I don't like is that when you open the door, at the bottom, the gate is too tall and my little pup always hits himself jumping out or he contemplates coming out.